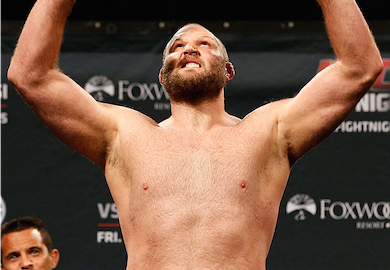 Ben Rothwell may have picked up a quick KO win over Alistair Overeem in the co-main event of their UFC Fight Night 50 scrap, but that doesn’t mean he was happy with what happened during the bout. Rothwell expressed his frustration with Overeem’s use of oblique kicks on Submission Radio, something Rampage Jackson also has a strong distaste for. Rampage at one point even called for the ban of oblique kicks, saying they have the ability to end a fighters career. Do you think they should be banned?